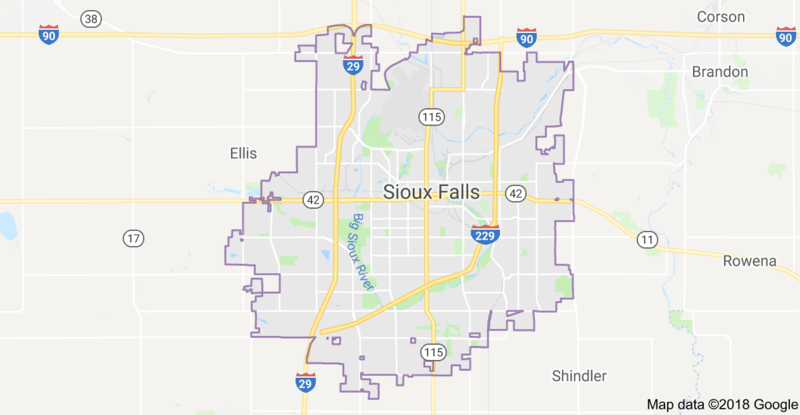 The overall area of Sioux Falls is 190.29 square kilometers, 188.97 square kilometers consist of land, and water covers only 1.3 kilometers. The town is located on the east of South Dakota State and is extremely near to the Minnesota borderline. The Sioux Falls Metropolitan Statistical Area is divided into four counties Lincoln, Minnehaha, Turner, and McCook. The Metropolitan Area estimated population had reached around 248.531 people in 2014. Together with Sioux Falls, some other cities conclude the metropolitan area. Those are Canton, Brandon, Dell Rapids, Tea, Harrisburg, Viborg, Worthing, Lennox, Beresford, Crooks, Baltic, Colton, Montrose, Salem, Renner, Rowena, Hartford, Chancellor, Parker, Humboldt, Hurley, Sherman, Garretson, Corson, Irene, and Centerville. Sioux Falls is famous for its parks and recreation sites. It has more than 70 parks and greenways that represent various types of flora and fauna. One of the most famous Sioux Falls parks is Falls Park which is located on the Sioux River north of the city downtown. Here the one may find the Falls Overlook Cafe, Observation Tower, Queen Bee Mill, and Stockyards Ag Experience Barn. Terrace Park, Sherman Park, McKennan Park, and Yankton Trail Park may be an incredible place to visit while being in Sioux Falls as well. A 31-kilometer path for biking, running, jogging forming a loop around the city and following the course of Big Sioux River, is a favorite feature of those parks. The biking pathway was constructed across the city area known as River Greenway as well. The city governance now is in the process of the plan implementation regarding the bike trail expansion. It will go to the east from Sioux Falls at Lien Park and connect the Big Recreation Area with Brandon and South Dakota. Falls that are the main attraction of the city. The Big Sioux River crosses the rock formation at this place and creates the most beautiful scenery. That is one of the most extensive falls in the world as it stretches for around 123 acres. The Queen Bee Mill, the 19th-century construction on the east side of the river, maybe another destination worth visiting. The Sertoma Butterfly House & Marine Cove shows a wide range of butterflies and the whole combination of wildlife. The 3600 square meter area show around 800 butterfly species taken from South Dakota only. The Marine Cove shows a wide range of corals and fish. The Great Plains Zoo & Delbridge Museum has an impressive collection of elephants, tigers, rhinos, and other large animals effigies. The museum is dedicated to the educational part of the natural wildlife and, therefore, it holds regular lectures and instructional guides through their exhibition. The Old Courthouse Museum was the first courthouse in the United States when it was built in the 19th century. The museum is somewhat impressive from the outside as it represents the country's past. Glass and Sioux quartzite stone were used during construction of the building. The Cathedral of Saint Joseph offers self-guided tours in the morning and afternoons that might be booked a week in advance. The building stands out significantly from the overall architecture of the city and allows to enjoy its exterior and interior. Moreover, in case if the one wants to get the full experience and impression of the cathedral, constant mass is held for the entrance of locals and tourists of Sioux Falls.